Luminex has received approval from the US Food and Drug Administration (FDA) for its NxTAG respiratory pathogen panel, which holds capability to detect 20 clinically relevant viral and bacterial respiratory pathogens. In October this year, the firm also received CE-IVD mark approval for the respiratory pathogen panel to market in the European countries. The respiratory pathogen panel detects atypical bacteria such as Chlamydophila pneumoniae and Mycoplasma pneumonia. The firm has developed the device for laboratories to simultaneously detect 20 respiratory pathogens in a single closed tube system, and will be used to respond to seasonal changes in demand, such as flu season. Luminex president and CEO Homi Shamir said: "The NxTAG Respiratory Pathogen Panel incorporates extensive user feedback, delivers expanded panel coverage, features a simple closed tube workflow, and is combined with the throughput and quality of results established by the NxTAG respiratory viral panel. "With advantages such as minimal hands-on time, fast time to results, and target masking for panel customization, the NxTAG respiratory pathogen panel offers clear advantages when compared with other respiratory panels on the market." The panel takes less time to detect pathogens and does not require any upstream reagent preparation. It allows the addition of extracted samples directly to pre-plated and lyophilized reagents. The tubes are then sealed to undergo closed-tube amplification and subsequent detection using the Luminex Magpix instrument. Its tube-strip design enables laboratories to manage variable sample demand by processing a single sample or up to96 samples per run, without wasting consumables or reagents. The accompanying Synct Software, which supports data analysis and reporting, enables the NxTAG respiratory pathogen panel to integrate easily into any laboratory. 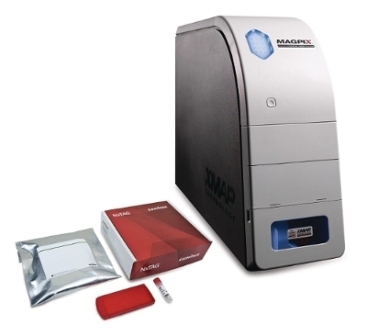 Image: NxTAG respiratory pathogen panel detects 20 clinically relevant viral and bacterial respiratory pathogens such as Chlamydophila pneumoniae and Mycoplasma pneumonia. Photo: courtesy of Luminex Corporation.